Georgian Antiques celebrates 40 years in business by proudly presenting the first major exhibition of work by the sculptor Phyllis Bone RSA (1894-1972). Trained in Edinburgh and Paris, she is now remembered principally for her architectural sculpture of the 1920s, including the Scottish National War Memorial. 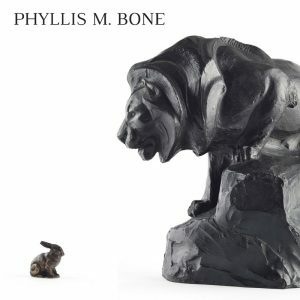 An exceptional ‘animalier’, she earned her livelihood by exhibiting finely modelled pieces cast in bronze or plaster. In 1944 the quality of her work was acknowledged officially when she became the first woman elected a Royal Scottish Academician. Remarkably, this exhibition is the first ever retrospective of her work. Collected over a 35 year period, it includes 36 display pieces in bronze and plaster covering a long and productive career from 1918 to the late 1960s. Also included are 9 works on paper made after she had moved from Edinburgh to Kirkcudbright, her home for her last 23 years. All works are from a private collection, so this will be the first time they are shown in one venue.